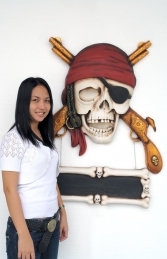 The Pirate Wall Decor with Guns is a great statement piece which looks fantastic on its own or as part of your Pirate theming decor with our other replica props and wall plates. Our "Guns" Pirate Wall Decor is a superbly detailed and very striking statement piece to hang on the wall. 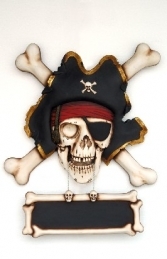 The Pirate Wall Decors come with a removable black-board hanging below for high-lighting your specials of the day etc. 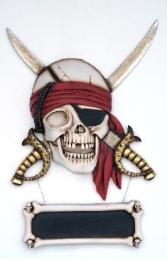 This 3ft by 3ft (approx) wall plate is ideal for all pirate themed areas, advertising or drawing attention to your business. It can be used in any themed area or in shops, businesses, pubs, restaurants, coffee shops, adventure golf courses, zoos, theme parks or even in your own home. PLEASE CONTACT US ON 01626 833646 or 078606 80181 TO DISCUSS THIS MODEL & THE OTHER FIGURES IN OUR PIRATE SERIES. PLEASE PHONE US TO PLACE AN ORDER & FOR A QUOTE FOR DELIVERY COST TO YOUR POSTCODE.